Pokemon kicked off the 2018-2019 season with a bang, sending four cards to the Lost Zone in the Expanded format with their Banned List and Rule Changes Quarterly Announcement that coincided with the release of Celestial Storm. Ghetsis, Hex Maniac, Puzzle of Time, and Wally will no longer be legal effective August 17, 2018. This marks the first set of cards banned in the Expanded format since Archeops and Forest of Giant Plants were banned heading into this previous season. Back in October 2016, I wrote an article discussing the future of the Expanded Format and looked at the options Pokemon has for maintaining it as they moved forward. In it, I discussed different reasons they may ban cards, and then gave my four card ban list as well. The four cards I settled on banning in the article were Trevenant XY, Ghetsis, Life Dew, and Archeops. Now, less than two years later, all of these cards have been addressed. Ghetsis and Archeops are now outright banned. Trevenant XY has lost the combo that allowed it to get turn 1 Item lock with the ban of Wally today. The concern I had with Life Dew was the infinite loop that could occur with Sableye DEX and Puzzle of Time. With the ban of Puzzle of Time, this is no longer a concern. For the rest of this article, I want to take a look at the four cards that were banned today and the fallout that results from each ban. I will start with the ban that I see having the largest impact, and then work my way down the line. By far the biggest ban of the day is Hex Maniac. The card gave every deck a 1-card tech that could be used to add Ability lock. With most decks in Expanded playing 4 VS Seeker, this gave players the option to Ability lock their opponent up to five times per a game (and more in Puzzle of Time decks), and with so many Expanded matches ending in just a few turns, this meant that effectively these decks were allowed to Ability lock for practically the entire game off a single 1-card tech. 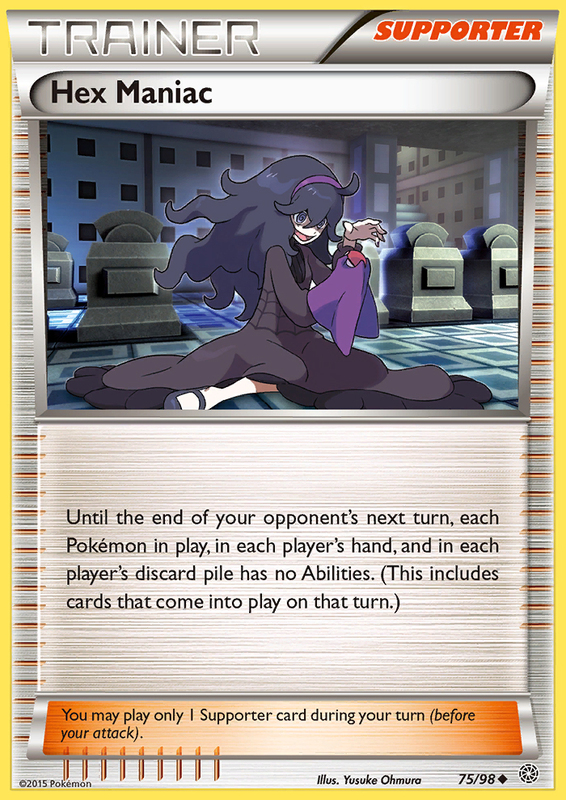 There are two main issues that Hex Maniac caused within the Expanded format. First, it prevented players from really being able to play most Ability based decks. Players trying to play decks like Bronzong in Expanded usually found them to be non-competitive because every deck that they played against could Ability lock them. The second issue was that it helped give a massive advantage to the player who went first. With many decks being reliant on Tapu Lele GX’s Wonder Tag and Shaymin EX’s Set Up for getting setup, this meant many decks failed to get setup when going second and simply lost games and matches by virtue of losing the coin flip. Moving forward, I would expect Ability decks to start to define the Expanded meta game. There are a lot of very strong Abilities lurking in the Expanded format that have been collecting dust for years, and it’s hard to focus in on which ones in particular are going to be the ones to breakout, but I would say its a safe bet that power accelerators like Eelektrik NVI, Bronzong PHF, and Malamar FLI should be some of the cards that become playable again. Safeguard Pokemon, such as Sigilyph DRX, Suicine PLB, and Hoopa SLG will be able to be used in Expanded to counter EX and GX Pokemon. Hoopa is by far the most likely of this group to actually see play as it is the only one that targets both EX and GX Pokemon. Overall, the format will follow the same Abiliity versus Ability lock structure that we’ve been playing with in Standard this season. You can Ability lock with Garbodor BKP/DRX’s Garbotoxin Ability, Greninja’s Shadow Stitching, Glaceon GX’s Freezing Gaze Ability, Wobbuffet PHF’s Bide Barricade Ability, and Giratina’s Devour Light Ability. There might be a few more obscure ways to shutoff Abilities, but these are the main ones. I will say, I did have a moment of panic today when reading the ban list and thinking about how good Greninja BREAK will be again and how annoying that will be, but then I remembered Giratina XY184 and felt good again, knowing I could slip Giratina into decks and use that to beat the crap out of Greninja. Of the pre-existing Ability based decks from Expanded, I think Volcanion and Archie’s Blastoise are the two decks poised to gain the most from the ban. Volcanion can now Steam Up to its hearts content, allowing it to hit for big damage quite easily while powering up its attackers with Blacksmith. Archie’s Blastoise is a massive winner, with not only Hex Maniac being banned, but also Ghetsis, the two primary tech cards that were used to stop it. 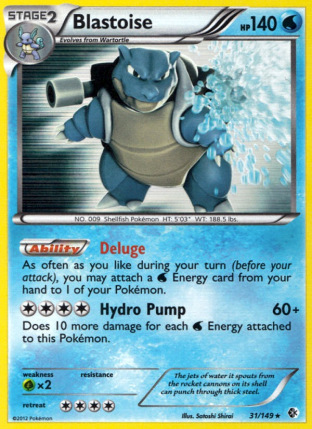 Outside of Wobbuffet PHF, the earliest any other deck should be able to disrupt its strategy is on turn 2, which gives the Blastoise deck a chance to always get going now. With a variety of attackers that can OHKO, with varying weaknesses, along with a strong non-EX attacker in Articuno ROS that also is a prize gainer, it’s hard to see Blastoise not jumping back up to the top tiers of the format. One potential issue I see coming from this ban is the availability of Tropical Beach actually becoming a relevant problem within the game. Traditionally, Tropical Beach has been part of the optimal setup engine for a variety of Stage 1 and Stage 2 decks. With more Abilities becoming relevant, I would expect more of these Stage 1 and Stage 2 Ability based decks to become part of the format. In many of these decks, Tropical Beach will probably be the optimal setup engine, which could cause the price of Tropical Beach to skyrocket. The availability of Tropical Beach has never been too big of an issue the past few seasons as only a handful of decks that have been viable have included it, decks such as Primal Groudon EX, Wailord EX, Vespiquen/Flareon, and Shock Lock. With Abilities now being more viable, it’s not hard to see a deck like Malamar, Bronzong, Magnezone variants, etc. being optimized with the play of 3-4 Tropical Beach for getting setup. If Tropical Beach takes on a role of great importance in terms of deck building for a format, it becomes a major issue that the majority of players can’t get access to the card, especially if the majority of the player base starts getting locked out of being able to play multiple Tier 1 strategies with an optimal list. To keep organized play healthy and the player base happy, I think it’s important that all players have reasonable access to all cards that are legal for play. It can definitely be argued right now that players don’t have reasonable access to Tropical Beach with a limited supply and what is generally a $200+ price tag. It becomes even worse if decks utilizing it start seeing tons of play and the price jumps up to $500, $600, who knows how high it can go. 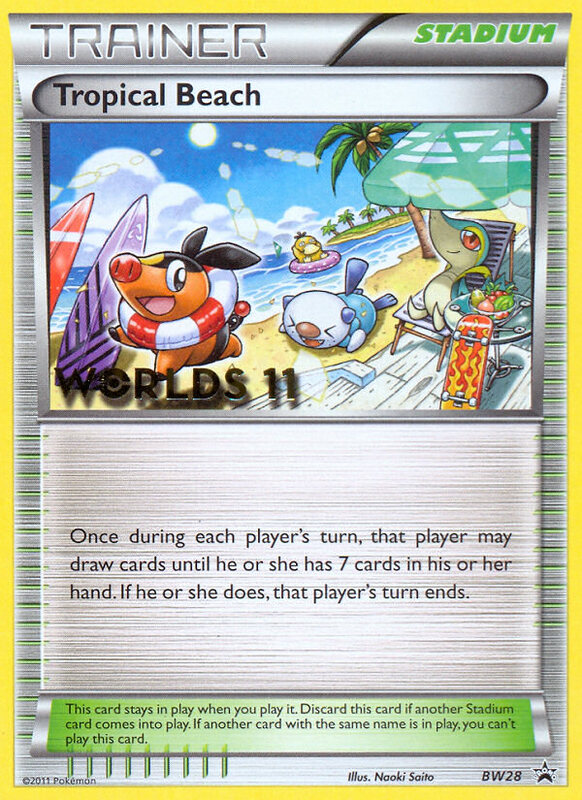 My advice for Pokemon would be that they should create an alternate art reprint of Tropical Beach. The card has generally proved itself to be a healthy addition to every format that it’s been legal in, so I definitely think Pokemon should take a reprint approach over banning the card in the future. Both banning and reprinting the card will negatively impact the card’s price, so if it comes down to needing to choose one or the other, reprinting makes the most sense. While the value would plummet, the World Championship editions should still hold some of their value, and because of their limited supply, would be more valuable than the theoretical mass produced alternate art reprint. I didn’t see this one coming, but it makes sense. Zoroark GX had gotten out of hand in Expanded during the second half of this past season so they wanted to target some key component of the deck, and Puzzle of Time has been closely linked with Zoroark GX ever since its release, so Pokemon decided to target it as part of its Zoroark nerf. Here is a rundown of some of the top decks that are going to be hit from this ban. 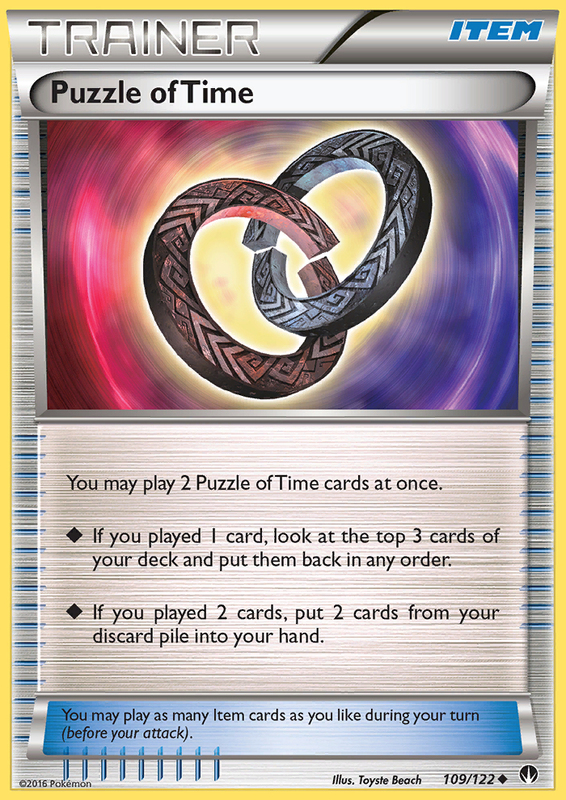 Zoroark GX – Zoroark decks have been played with Puzzle of Time in both the Standard and Expanded formats since the card’s release. As Zoroark GX was able to build up massive hand sizes every game, it was the deck most able to piece together two Puzzle pieces at the same time to trigger the effect of bringing back two cards from the discard pile. This gave Zoroark decks greater access to reusing their resources than any deck in the game that wasn’t specifically designed to reuse resources. Night March – When Puzzle of Time was released in BREAKpoint, Night March instantly became a Tier S deck, with the format devolving into one in which players either played Night March themselves, played a deck that countered Night March, or played a deck that didn’t win tournaments. Technically M Manectric EX won some State Championships, but I don’t think anyone really knows how that happened. Night March was reliant on Puzzle of Time to get back its Double Colorless Energy and in more recent formats, to get back its Battle Compressor to recover from an opponent’s Karen. It should still be able to get by fine Energy wise by playing Special Charge, but a Karen should hit it much harder now. Night March also patched over a ton of matchups with Hex Maniac, so the combination of losing Puzzle of Time and Hex Maniac hits Night March hard. Is this the end of the road for Night March, or does Peter Joltik have another list up his sleeve? Sableye/Garbodor – Sableye was certainly viable before the release of Puzzle of Time, but what Puzzle gave it was the ability to wait on deciding what resources they wanted to get back until their turn, allowing the Sableye player to make more optimal decisions throughout the game as they would be better informed in regards to what they needed to recover. 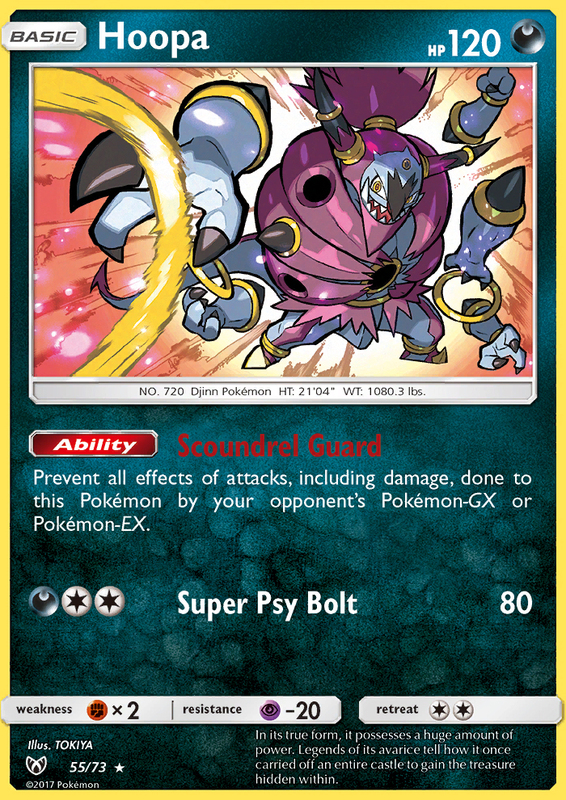 It also introduced a toxic combo in which Sableye deck could infinitely loop Life Dew, potentially creating situation where an opposing deck could never take a prize against it if they were out of Tool removal or gust effects. Wailord EX & Sylveon GX – These are two more disruption/stall based decks that played Puzzle of Time to reuse these disruption and healing cards. I grouped these two together without Sableye since they don’t have the potential for the Life Dew loop that Sableye does. Primal Groudon EX – Puzzle of Time was included in perhaps the most famous list for this deck that Christopher Schemanske used for a 2nd place finish with the deck in Toronto during the 2016-2017 season, but it’s worth noting, the last two players to Day 2 with the deck, Joe Sanchez and Stephane Ivanoff, both chose not to include any copies of Puzzle of Time in their deck. I don’t think this ban has close to the impact as the Hex Maniac ban does, but it does chip away at the power of some of the most successful Expanded decks in Zoroark GX and Night March, however, I think both decks lost more power from the Hex Maniac ban than the loss of Puzzle of Time. I’m a little sad to see Ghetsis go, as I don’t think the card was nearly as bad as the reputation that it got, but I can definitely see the reasoning for the ban. I think there are both positive aspects for Ghetsis being in format and negative aspects for it being in format. The big negative with Ghetsis was that it contributed to the massive amount of advantage that was gained from winning the coin flip. 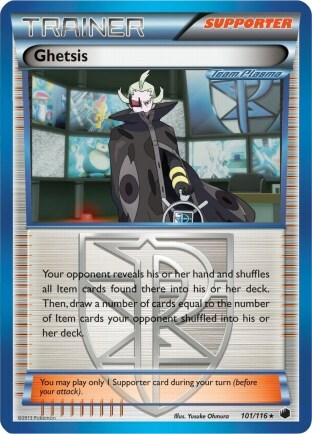 If you went first, played Ghetsis, and stripped your opponent of their own Supporter out (Computer Search, Ultra Ball, etc.) then they often just lost the game from that one single play. No one really has fun in a game that was decided by a single play with no element of skill involved. Much of the fun of playing this game revolves around trying to play more skillfully than your opponent, so removing that element from game play will always diminish the fun players have at tournaments. For this reason alone, the ban is justified. However, it is worth nothing that Ghetsis also contributed positively to the format. It acted as a counter to Sableye’s Junk Hunt and has traditionally been a counter to Item heavy decks the turn after they use Tropical Beach. Additionally, it provided players an alternate means to N to disrupt their opponent in the mid and late game. I’ve long hated that Trevenant XY was able to get a first turn Item lock and found this to be the most toxic deck in the game for a few years now, so I am definitely glad for that combo to be gone. Trevenant BREAK decks already felt like they were on shakier ground this past season, and with every deck now getting at least one turn to play Items against them, it’s hard to see them remaining relevant next season. It is interesting that they chose to ban Wally instead of Trevenant itself. It does appear that Pokemon has a preference to ban Trainer cards over Pokemon cards when possible. With Wally seemingly being no good for anything except Trevenant BREAK decks, it’s possible that Pokemon decided that this ban makes the most sense as it is the ban with the least impact they could make, as it serves the purpose of shutting down the Trevenant BREAK deck (we think), while leaving the door open for something like Trevenant XY/Accelgor DEX to see play. 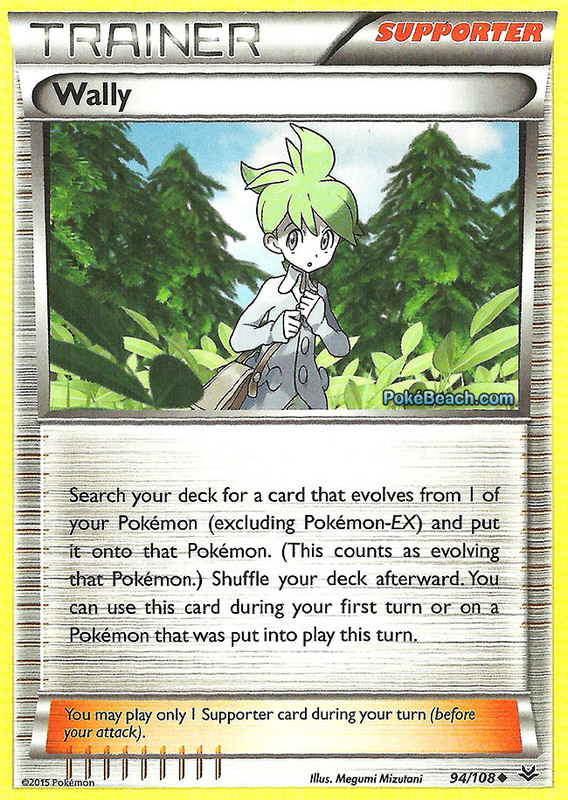 With Wally not seeing play elsewhere, at the very least, nothing existing is impacted from the ban of it, and it also protects Pokemon from a possible future deck that uses Wally to set off a toxic combo. I think it was necessary for Pokemon to make some bans in the Expanded format headed into this season and they stepped up to the plate. Interest was definitely waning in the format as players got fed up with the prevalence of toxic first turns and a deck that was too good in Zoroark GX. With these bans, we’re set for a wild ride in the Expanded format next season. I would expect Expanded to be super volatile this season, at least early on, jumping around greatly from tournament to tournament as players discover what decks are truly powerful in the new, Ability laden Expanded frontier, and then what can counter the most powerful concepts that initially emerge. I think going from a format that was largely absent of Ability reliant decks to one in which they will have an opportunity to succeed is such a drastic change that the previous seasons of Expanded will be mostly meaningless and we will see a completely new Expanded meta emerge for this season and beyond. I just made a list for Bronzong/Scizor after I read that Bronzong will be more viable, at least at the begining of the season.